About fifteen years ago, I visited Morocco for the first time. I totally fell in love with the culture, its gastronomy and various landscapes. It was a marvelous travel experience. I didn't see the country from a tourist's perspective since I had the opportunity to live with friends. I went to the hammam with the girls, stayed in the most enchanting palm grove (yes, I have a thing for palm trees! ), wore a caftan at a friend's wedding, went to the beach with the family, learned to cook a chicken tagine with green olives, ate plenty of local pastries, went shoe shopping in the coolest part of town, bought souvenirs at the souk, visited Jemaa el-Fnaa at night, tried barbary figs sold on the streets, went to the spice market along with my friends' grandmother, drove in the desert for hours, visited Yves Saint Laurent's villa in Marrakesh, met an artisan specialized in zellige (the famous terra cotta tilework) who had just renovated the Koutoubia, learn a few expressions and slept in a riad that had once belonged the royal family. One of my greatest finds from this eye-opening trip is argan oil. This multipurpose oil is extracted from the kernels of argan trees, which have been around for about 70 million years. Although this liquid gold has been cultivated along the Atlantic coast for ages, it was fairly unknown outside of North Africa until the 1990s. While the argan forest has since then been recognized as a Biosphere Reserve by UNESCO, the production itself remains handmade by Berber women in fair-trade cooperatives. It's in Marrakesh, that I first tried this mighty restorative oil. When my mother's friend said to me that the golden liquid was her ultimate beauty secret, I was intrigued. With high levels of fatty acid and vitamin E and A, argan oil can be used to treat a plethora of skin conditions such as dry skin, acne, wrinkles, eczema and even oily skin. It can also be very effective as a hair conditioner, to tame flyaways, as a lip moisturizer, to prevent stretch marks during pregnancy as well as to hydrate hands and nails. With so many uses and benefits, it's no wonder this miracle oil is on everyone's beauty list these days. Lately, I've made another fabulous discovery. It's a new line of argan oil named ArganLounge. What is so unique about this brand? 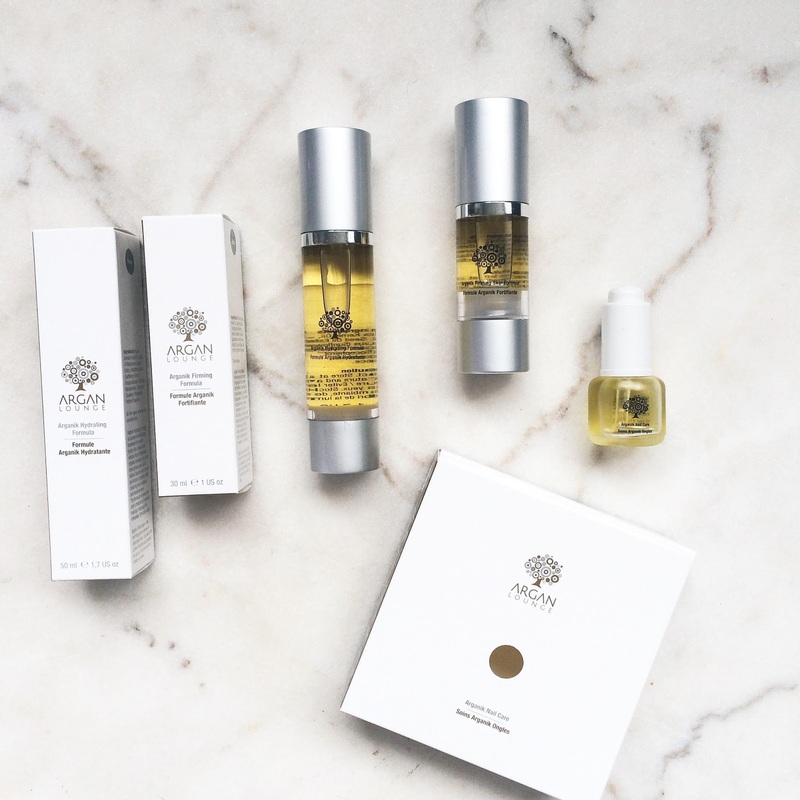 Their products contain between 91% and 96% of pure argan oil, which is an extremely high percentage compared to major brands available on the market. 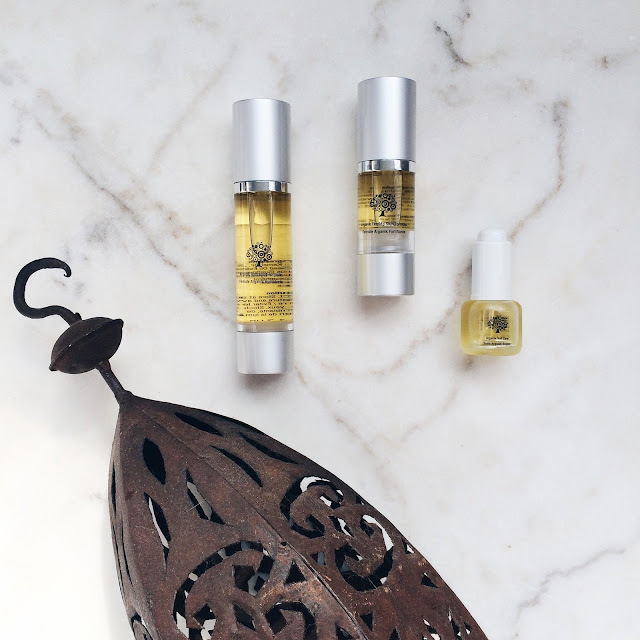 Many of the ArganLounge products are made with a combination of argan oil with other natural ingredients - such as Macadamia oil and sunflower seed oil - known for their hydrating and anti-aging properties. I have tried three products from the line: the Arganik Firming Formula, the Arganik Nail Care and the Arganik Hydrating Formula. I love to slather the oil at night and leave it to work its magic as I sleep. It's a relaxing nighttime ritual to do before bedtime. I often make use of this moment to give myself a proper face massage with the technique I have learned from beauty guru Lisa Eldridge. Once the oil is absorbed, it leaves the skin feeling so soft and nourished, but not at all greasy. And the best part is definitely to wake up to a youthful and radiant glow, it's just the best feeling in the world. I have started testing these products during my recent beach holiday. I was amazed at how my skin always looked so supple and hydrated in the morning despite the sun, the wind and the swimming sessions in pools with chlorinated water. That's what I call a conclusive test! 1 comment on "My Secret To Glowing Skin"
Nice post! The product seems too good. I would definitely love to use these products.